Remember our singing elephant? The one that my whole family hates, but E love so much? Well it officially makes the list as the second toy we’ve played with so much that we’ve killed the batteries. A singing toy truck from our neighbors was the first, and I’m pretty sure a singing laptop from my parents will be next since it’s been struggling and making some interesting noises lately. Are you sensing a theme? Our Bubba likes things that sing to him! When the elephant failed to ask us about our ears last weekend, we figured we’d just replace the batteries as we’d done with the toy truck, and then everything would be good as new! Tom got out a screwdriver and went about trying to open the battery compartment. And tried, and tried. Then I tried. Then again later in the day. And again after E had gone to bed. We googled to see if there were tricks. We looked at the Gund homepage. And found nothing. Eventually I gave up and went on Amazon to buy a new Flappy which will hopefully look and sound the exact same so that E won’t notice the difference. Tom, however, wouldn’t give up. He declared that he wouldn’t be defeated by an elephant! As I was pressing submit on my order, he was attacking the poor thing with pliers. He eventually got the compartment open, but all that did was confirm the poor design. In order to open the battery compartment, he needed to break the door. Something about a washer being glued in place or something. Either way, Flappy was no longer safe to use, and so away she went as we await her replacement. 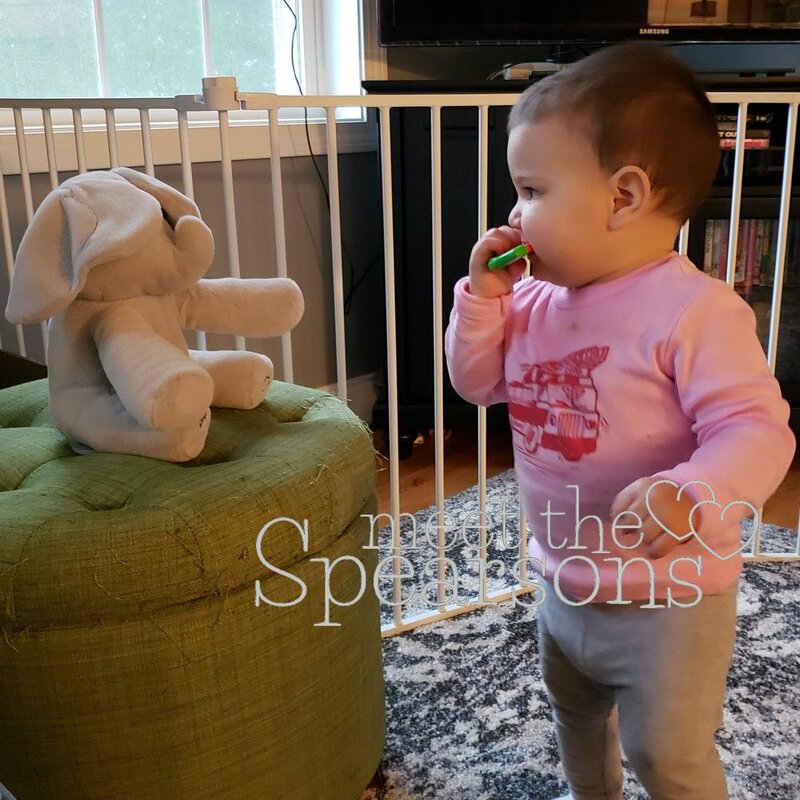 And then we went to bed and completely forgot about her sitting in the trash until the next morning… luckily E was quickly distracted by his milk, and hopefully we didn’t create any lasting scars from him seeing his beloved elephant torn up in the trash!